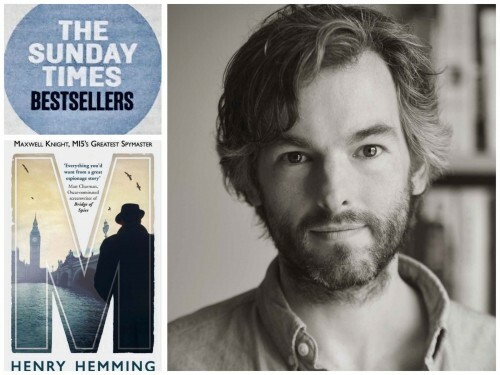 Congratulations to Henry Hemming, whose book M: Maxwell Knight, MI5's Greatest Spymaster (Preface / Random House UK) has spent several weeks as a Sunday Times Top 10 Bestseller. Henry’s book has received exceptional reviews from critics in both the UK and US, and was also selected as Waterstones Non-Fiction ‘Book of the Month’. When it comes to espionage, the truth is invariably stranger than fiction, as author Henry Hemming discovered when he began researching his new book M. An ever-more twisting tale of intrigue at the heart of the British establishment, it is the story of one of MI5’s greatest and most eccentric spymasters, Maxwell Knight, and the colleagues whose secret, second lives are only now coming to light. From animal-loving housewives to dandy booksellers, Hemming introduces the real-life agents drawn out from the shadows of history. The silliest I felt when researching M, my biography of the MI5 spymaster Maxwell Knight, known to his colleagues as ‘M’, was the first time I worked out the identity of one of his undercover agents. I was in the reading room of a particularly quiet archive. There were cameras watching my every move. So presumably somebody, somewhere, witnessed the moment when I let out a weird involuntary yelp and made to punch the air, before realizing where I was, un-punching the air, and trying to carry on as if nothing had happened. This feeling became more familiar as I identified more of the men and women to work for Knight. This man was arguably MI5’s greatest spymaster. He was also without doubt MI5’s most eccentric spymaster. From 1931, when he joined what is now the Security Service, through to his retirement in 1961, Knight kept in his poky London flat a menagerie of weird and wonderful animals, including, at one point, a bear. His superiors didn’t mind, largely because of his ability as a spymaster. Knight had a rare and intuitive gift for recruiting undercover agents, running them and manoeuvring them deep inside extremist political groups. The spies who worked for him are referred to in MI5’s declassified documents by their codenames, such as ‘M/1’ or ‘M/F’. As I delved deeper into Knight’s life I realised that if I was ever going to get under his skin and begin to inhabit his world, I had to work out who these unidentified agents were. This involved travelling to archives all over the country in search of clues. One of these was the National Maritime Museum in Greenwich, which is where I was when I pinned down the identity of the MI5 agent codenamed ‘M/7’ (and let out that involuntary yelp). ‘M/7’ had filed a report, in 1939, about an awkward meeting with a political extremist. This encounter went so badly that the target of this investigation had made a note of it in his diary, which is what I had gone to see in the National Maritime Museum. It turns out that ‘M/7’ was a country squire and cricket-loving barrister called Vivian Hancock-Nunn. Despite his background, Hancock-Nunn managed to earn the trust of senior Communist lawyers and spied on them for almost a decade. Another agent I was able to identify was the bookseller and bibliographer Graham Pollard. There’s a moment in the late 1920s when Pollard’s life reads like something out of an implausible novel. A typical day for him began with lunch at the fashionable Chez Victor, after which Pollard put in a leisurely shift at Birrell and Garnett, the Soho bookshop that he co-owned, went to see his Bloomsbury friends, attended a meeting of the Communist Party, reported on all this to his spymaster, ‘M’, before going home to his wife, a Communist, who was still unaware that her husband was a spy (and possibly spying on her). Of all the agents that I identified, my favourite was Kathleen Tesch. Several weeks before the start of the Second World War this modest, animal-loving housewife found herself in Germany having a one-on-one interview with Hitler. Had the Nazi leader twigged that Tesch was an MI5 agent, she would never have made it out of Germany. Instead she came away with a signed copy of Mein Kampf. As well as turning ordinary people like Kathleen Tesch into extraordinary agents, Knight was famous within MI5 for his pioneering belief that women generally made better spies than men. But Maxwell Knight had a weakness: sometimes he could be blinded by personal loyalty. Knight’s first espionage job, back in the early 1920s, had been to infiltrate the British Fascists. In here he befriended and took on as an informant a young man called William Joyce, who later became the Nazi propagandist ‘Lord Haw-Haw’. Early on in my research I read about a strange rumour that Joyce had been able to escape from Britain, shortly before the outbreak of the Second World War, because he had been tipped off by Maxwell Knight about his imminent arrest. In the National Archives, in Kew, I found the documents revealing what happened. Amazingly, Knight did tell Joyce that he was going to be arrested. At this crucial moment in his life, he had placed personal loyalty above everything else. Several days later, Britain went to war with Germany. Now Maxwell Knight had to atone somehow for his mistake. What he did next would not only cut to the core of who he was, it was also a punishing test of character for his agents out in the field. These men and women were sworn to secrecy for the rest of their lives about their MI5 work. Only now, years after their deaths, is it possible to work out who they really were and to get a sense of the extraordinary sacrifices they made.